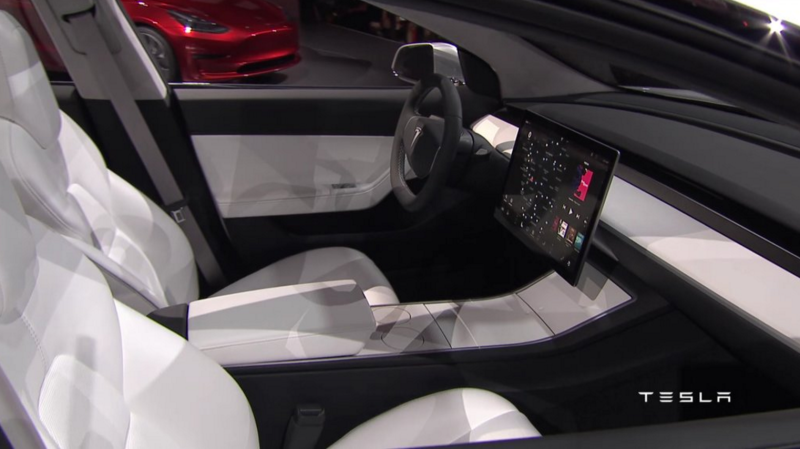 The Tesla model 3 car is the third step on tesla’s initial road map formulated 10 years ago by Elon Musk. It is a high volume affordable electric sedan that will change the way we move. It is a fully electric car with a range per charge of 215 miles minimum and autopilot hardware priced at around 35.000 $. First car will be delived towards the end of 2017 as was announced by Elon Musk in the unveil event. It’s a 5 seat sedan that goes 0 to 60 mps in under 6 seconds and has 5 star rating. A prototype was reaveled in march but the final car might be slightly different. Even the different cars shown had different styling elements ranging from doorhandles to more significant elements. One distinctive element of a car’s design : the grill is missing in electric cars as it has no more practical purpose. Although some parts of electric cars need cooling, those are far for where the grill was in a classic car. It remains to be seen if it will have a full fake grill, a glassy grille replacement panel as in the model s or stick with no grill at all. The car interior is super simple with no apparent dashboard or controls except for the central 15 inch touchscreen. There is some rummor based on the processing power of the onboard video processor fron nvidia that it might feature a HUD display projected on the windscreen but nothing official yet. It could also be based on the price of model 3 compared with the other more expensive models, Tesla had to cut some corners to be able to achive the promised price of 35.000$. Another posible explanation is that it could be a self driving car. Tesla model 3 has already registered around 400k preorders since the unveil and first cars should be delivered next year during the middle of the year 2017. New orders, according to tesla website https://www.tesla.com/en_GB/model3 will be delived in mid 2018, so if you want a piece of the future you have to stand in line. To reserve a model 3 you have to make a downpayment of 1000$ and you can reseve up to 2 cars per person.